Of the different types of powered grinders available, the angle grinder is probably the most common and widely used. Angle grinders fitted with the appropriate disc can be used to grind and cut metal or stone. For metal cutting or grinding the discs are usually made from a reinforced abrasive material. For stone and masonry cutting, the discs may be either abrasive cutting discs, or a diamond cutting disc. Whilst far more expensive, a diamond cutting disc is superior to an ordinary abrasive discs - it will make a much cleaner and faster cut, and the discs will last far longer than abrasive discs - ultimately a diamond cutting disc represents much better value. A diamond cutting disc should never be used to cut metal as it will quickly be destroyed. Angle grinders are available in different sizes of grinding/cutting disc, voltages and wattages. The smaller angle grinders operate at higher speeds - 4½ inch grinder will typically operate at 10000 rpm whereas a large 9 inch grinder will rotate at only 6500 rpm. Because of the higher speed, the smaller discs tend to wear out faster than larger ones - but the smaller discs are cheaper so there may not be any advantage in having a larger grinder. Angle grinders are available to operate on 110 or 230 volts AC - the 110 volt ones are intended to be used with a step down transformer for added safety on work sites. 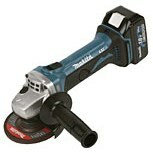 Air operated and cordless angle grinders are also available. Typically wattage range from 500 to over 2500 watts - the higher the wattage, the more powerful the grinder will be - the larger the grinder, the larger the wattage. A side handle - typically the handle will be attached by a screw and can be fitted to either side of the angle grinder to suit both right and left-handed operators. A spindle lock - to lock the spindle when the disc needs to be changed. A 'dead man switch' - this means that the operator has to hold the switch in the ON position - should the operator let go of the grinder, it will switch off thus reducing possible injuries. Vibration damping handles - this will make using the grinder less tiresome. Safety clutches - this will disconnect the disc if it becomes jammed, thus preventing possible injuries. A soft start on larger angle grinders - this will reduce the 'kick' when the grinder is first switched on. Cordless angle grinders are available which makes working at heights or away from mains power a lot easier than having trailing power leads. These are currently limited to the smaller (4½ inch - 115mm) disc size. 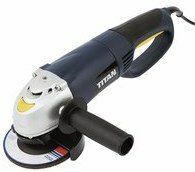 Power is usually provided by rechargeable Lithium-ion battery technology - this gives high power and low weight, it also has the advantage that they hold their charge during storage - so if you only use the grinder occasionally, you shouldn't find the battery flat when you do come to use it. A battery charger is normally supplied as standard - this may include a 'fast charge' feature which enables the batteries to be recharged in a short period - typically an hour or less. This can be useful if you only have one battery pack. However it is a good idea to have two battery packs, so you can carry on using the angle grinder while the other battery pack is being recharged.